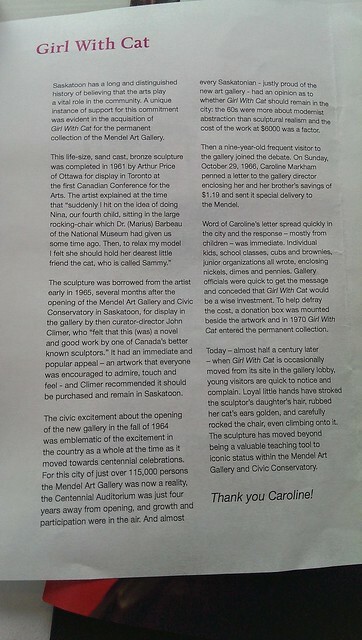 Roadtrip 2014 – The Mendel Art Gallery in Saskatoon – vegan in your city. I’m playing catchup on our writing about our 2014 Roadtrip around North America. At this point, we had driven from Toronto, through Michigan, taken an extended stop in Chicago, IL, and driven on through Wisconsin, Minnesota, North Dakota, stopping in Winnipeg, MB and Riding Mountain National Park. Our time in Saskatoon was winding down, and one thing I wanted to show JC was the Mendel Art Gallery – a place I viewed as a refuge from the blahs, and the occasionally rough Saskatoon winter. A place to see new and old art, a good source of regularly good fancy coffee (at Museo), and the lush greenery of the conservatory space. 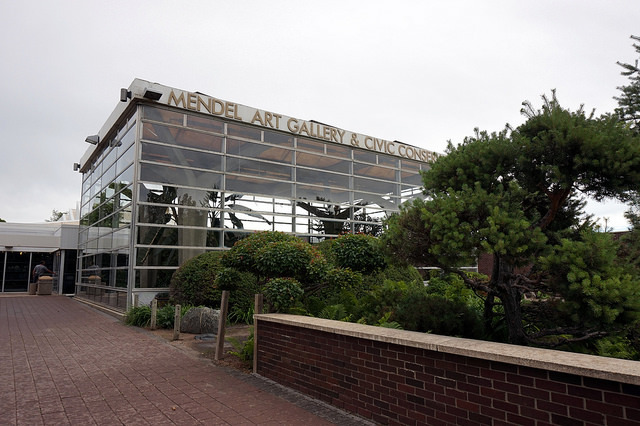 Sadly, as I found out while I was there, the Mendel Art Gallery is closing this year, on June 8th, 2015. I’m glad I go to see it at least one more time, because I do have a lot of great memories of that place. I’m hopeful that the Remai Modern centre will still touch on some of those enjoyable qualities – but that’ll be more apparent when they open up in 2016. 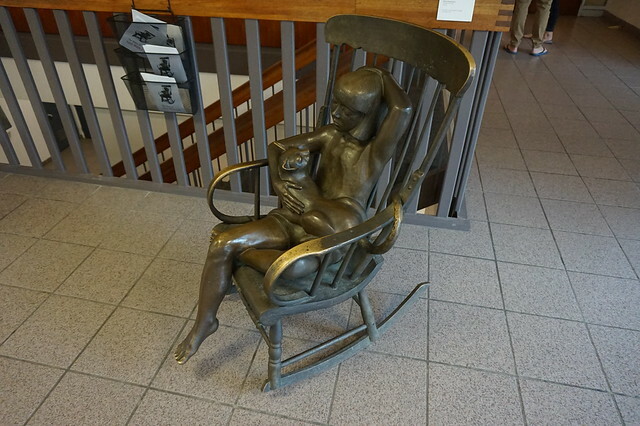 Unusually, the gallery isn’t very pro-camera, so I couldn’t take any pictures of the other exhibits – but if you go in the entrance you’d see this bronze sculpture of a Girl With Cat which you can take photos of if you want to. I remember seeing this and delighting in the sculpture every time I went in. I have to share the story of this sculpture, because it has all the lovely touching stuff that a good story has, but – spoilers – it ends on a bit of sad note. I read the pamphlet all over again, every time I was at the gallery. It’s one of those feel good stories where one kid sparks a movement, and that’s one of my favourite things to hear about. So, The above statue was well loved, and was borrowed for the Mendel Art Gallery in it’s early years, in 1965 from the artist – Arthur Price. They liked it so much, that they wanted to buy it, but it had a relatively high price tag (at the time) of $6000. 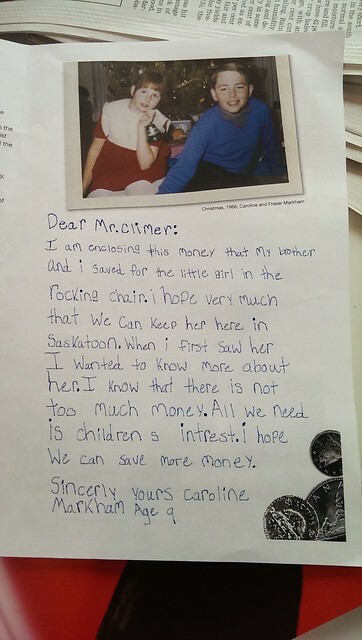 A little girl, Caroline Markham, just 9 years old, wrote a letter to the curator-director urging him to keep the Girl With Cat at the gallery and sent him $1.19. Her letter sparked a community-wide push from kids and kids organizations donating whatever money they had to keep the Girl with Cat, wisely, the officials listened to all the voices, and the sculpture entered the permanent collection. So this pamphlet sits near the statue telling the story of how it ended up being in the museum. As we sat in Museo (the gallery cafe) sipping soy lattes and taking a technology break (they’ve got wifi), I looked up Caroline Markham to find out what she was up to now. But sadly, she passed away in 2010, but she did know the impact she had on the gallery, and how much her actions were appreciated. And on that note, we went into the beautiful Civic Conservatory (which they seem to consider separate – but I don’t separate them. 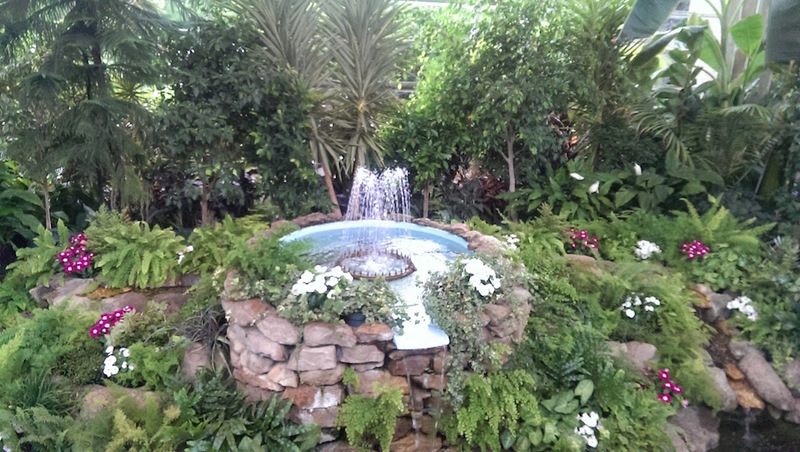 There was a beautiful flower display, a strange yet interesting auditory art installation, and their usual collection of orchids and tropical plants. While we were nearby, we popped over to the University of Saskatchewan and the nearby Synchrotron. 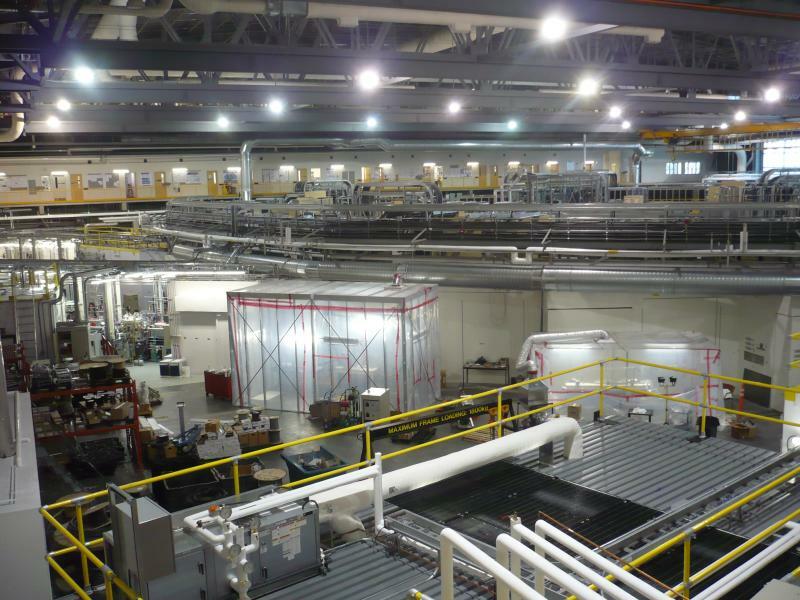 One of my biggest regrets on the trip was not being able to go to the guided tour at the Synchrotron with JC, but I did get to see it in 2010. Maybe next time! Our next stops in Saskatoon would be visiting the Street Cat Rescue office, Ufondue, a vegan friendly fondue spot, and a walking tour around Saskatoon’s downtown, where I’d show JC a few of the spots I used to visit often. Gallery, not food, saskatoon. Bookmark.